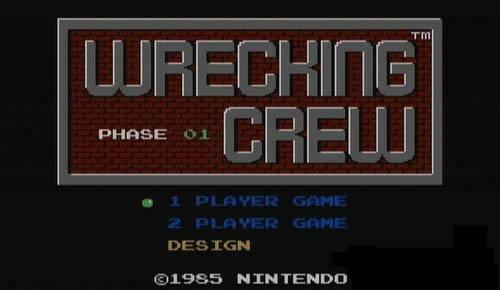 Wrecking Crew: Its a total wreckage here, today we feature a new game at Super Luigi Bros and this time it's the very unknown Wrecking Crew! 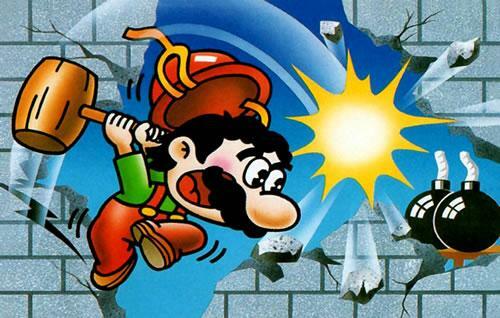 A game featuring Mario with a hard hat and his signature hammer, moving around 100 levels of pure wrecking fun! It came first as a great arcade game part of the VS. Series as VS. Wrecking crew back in 1984, it then made it debut on the Famicom/NES in 1985, it featured the original 100 levels, a 2-player mode with Mario and Luigi, in his pink outfit, and the design mode where you could build your own Wrecking Crew Levels. Video Walkthrough - How to beat all 100 phases. 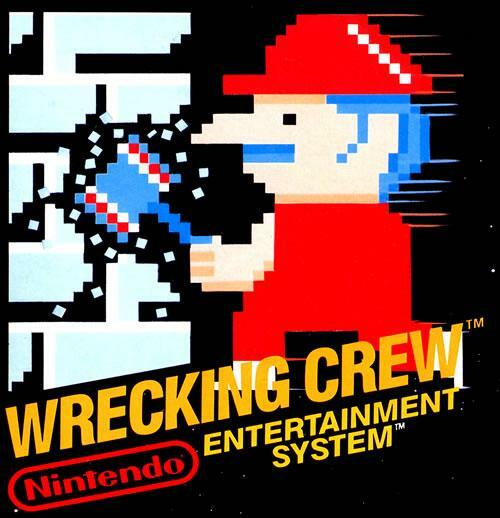 Our playlist of Wrecking Crew (NES) by Ben. Playing this game is easy as pie. You cant jump, A will swing your hammer, same as B. Move to the sides with the left and right sides of the D-Pad and climb up and down ladders with up and down. Simple, huh? That’s pretty much everything there is to this great game, but the whole simplicity ends as the levels progress. 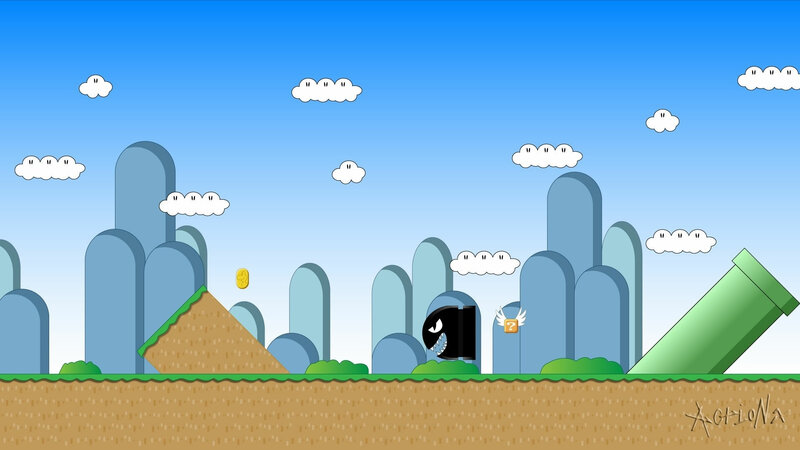 You may pause the level with Start and scroll up and down to see the whole level, and of course you may press SELECT to quit the level and re-start, your high score will not be recorded and you will be brought back to the start of the level though. There are many type of walls and objects that will help you clear each level. A level is cleared when all walls are destroyed, despite if you are just hit by an enemy, if all walls that can be broke are destroyed, the level is clear! Gray walls: Gray walls will take one hit. Brick Walls: Brick walls take two hits. Dark Brick Walls: This will take three hits. Ladder Walls: These have some ladders which you can climb up, they break with one hit too. Ladders: The ladders are unbreakable and can be used by Mario, Luigi and all enemies. Barrel: The barrel blocks your way, as well as the way of other enemies, if you break a Pillar you can trap an enemy inside of these barrels. Green Door: The green door can be open to take enemies to the other side of the wall, they wont hurt you if they are there. If all enemies enter through the green doors on the level, the time will stop while they are there. Bomb: The bomb will detonate if you hit it with your hammer. It wont explode inmediatly but if it does it will knock you down to the first level of the phase you are on. The bomb will break walls in sequence until it finds and unbreakable wall or an empty tile. Prizebomb: Some bombs are marked as “prize bombs” that will sprout a certain item if they are broke after two other bombs are broke on the level. Depending on the number of times your hammer is swung after breaking the second bomb on the level you may get the mytical Golden Hammer, or prices like a Pig, a Cat, or even Santa Claus. M,A,R,I,O: Some walls have these hidden. They have to be found IN ORDER, otherwise you wont get the extra lives. Foreman Spike: Spike hired the Mario Bros. because well, he had to, but he dislikes them a lot, he will do all he can to make them look bad, he travels through half of the phases trying to knock Mario over and break bricks. He is important because some levels are not beatable without his help, however he makes other levels unbeatable thanks to him messing up the order in where walls are broken. You can break the wall he is behind of and bring him down to the first floor of the phase. GotchaWrench: They are living wrenches! The red variation is slower, and moves on a path to where you are and will find the fastest way to get there. The purple is faster, but is silly and will climb a ladder if it sees it. Make sure to avoid them and know how to lurk them by going to the other side of the phase. Eggplant Men: The mythical Eggplant Man. We don’t know what are they doing here, but well, we have live wrenches might was well have Eggplant Men, maybe they want to be wizards? Who knows, they will chase Mario over until they find a ladder, they will climb it and proceed. They always do this, and sometimes are fairly fast. Fireball: A fireball randomly appears if you are for too long on a level. They move around with the beat of the music, so beware. They can be dodged but it takes some skill. Challenge this retro game, it is really enjoyable and a challenge, some levels have only one solution and can be really hard, keep persevering and if you have any questions, don’t be a stranger, pass through the forums and start the conversation!